Anti-abortion harassment: Feminist Majority Foundation survey of clinic workers. Ten ways that laws and law enforcement should protect clinic workers. Shirley Phelps-Roper of the Westboro Baptist Church joins other Phelps followers to protest the funeral of Dr. George Tiller as supporters hold their own signs across the street on June 6, 2009, in Wichita, Kansas. At first blush, this sign might not seem any more disturbing than the others. However, its troublesome meaning becomes clear when you consider the history of Wichita. Less than six years ago, George Tiller, a Wichita abortion doctor and one of the most high-profile abortion providers in the country, was assassinated point-blank on a Sunday morning in the foyer of his church. Tiller was the eighth abortion provider murdered in this country for his work. After Tiller’s murder, his clinic closed. Burkhart’s clinic opened almost four years later in the same building and is the only abortion clinic in Wichita. She and others who work at the clinic have been the target of abortion extremists almost since day one. According to a recent Feminist Majority Foundation report, personal targeting of abortion providers is rising precipitously. The 2014 National Clinic Violence Survey tallied the responses of 242 abortion providers from around the country. Providers were asked about their experiences with violence, harassment, and intimidation directed at clinics generally and patients. They were also asked about being targeted individually, which is our concern here. The study’s findings are alarming. The Feminist Majority Foundation compared the 2014 findings with its previous report on the subject in 2010 and found large increases in personal targeting. In other words, Burkhart’s experience a few weeks ago was hardly an anomaly. In fact, these types of targeted harassment tactics have been drastically increasing. For the past four years, we have been doing our own study of targeted harassment of abortion providers. We have conducted almost 90 in-depth interviews with abortion providers around the country about their experiences with targeted harassment. We asked them to describe their experiences, talk about how those experiences affected their day-to-day lives, and how law and law enforcement have assisted them, if at all. These interviews form the basis of a book, Living in the Crosshairs: The Untold Stories of Anti-Abortion Terrorism, which will be released in May. The interviews we conducted and the experiences we write about in the book complement the findings of the Feminist Majority Foundation report. Abortion providers live with a staggering amount and variety of targeted harassment. This kind of individualized targeting is not a relic of past decades, when Operation Rescue made nightly news with clinic blockades and bombings. Rather, it continues with new harassment to this day. Providers told us about being physically assaulted, picketed at home, threatened over the phone, and stalked around town. Providers’ children have been the subject of protests at school, providers’ parents have been harassed in nursing homes, and their spouses have been targeted at work. The list of tactics is almost endless. This kind of targeting can happen to anyone who is associated with an abortion clinic, not just high-profile doctors like Tiller. Administrators, nurses, security guards, volunteers, building owners—anyone associated with a clinic is at risk of being targeted. Years and years ago, I thought about it and said to my wife, “One of these days I might not come home. I might get killed.” I’m not going to wear a vest. I’m not hiding from anybody. If I get killed, I get killed, it’s just the way it is. So I don’t worry about it. I lose no sleep over the threats. In other words, I’m not afraid. I don’t drive up to work wondering, “Who is here? Who is not here?” I just park. To me, it’s part of my life. You get up in the morning, you brush your teeth, you go to the bathroom. On a Friday, I’m coming up here, I expect to see them. Just a part of what I do. For others, though, this kind of harassment takes a serious toll on their lives. While only one of the almost 90 providers we talked with stopped providing abortion as a result of the harassment, many others alter their lives in significant ways. They take different routes to work on a regular basis, they change their schedules frequently, they plan their living arrangements as a precaution, they buy guns, and they wear bulletproof vests. They do all this for no reason other than that they work as abortion providers, a lawful profession in this country. The providers we talked with gave moving explanations of why they continued in this line of work despite the harassment: a commitment to women, their patients, and the cause; a refusal to let the extremists win; a felt personal responsibility not to go back to the days when women died from illegal abortion. But abortion providers should not have to have such superhuman resolve to continue their work. Law should step in and do more to protect abortion providers from this kind of harassment. In 1994, Congress enacted the Freedom of Access to Clinic Entrances Act, which prohibits, among other things, blockading an abortion clinic or physically threatening or injuring abortion providers. As a result, blockades of clinics, a regular protest tactic in the late 1980s and early 1990s, have become significantly less common. However, as the Feminist Majority Foundation study and National Abortion Federation statistics show, other forms of harassment and targeting have not declined since FACE was enacted; in fact, some types of harassment, such as vandalism, burglary, stalking, and the kinds of personalized targeting we have researched, have increased. Adopting no-tolerance policies for illegal activities directed at clinics and providers. 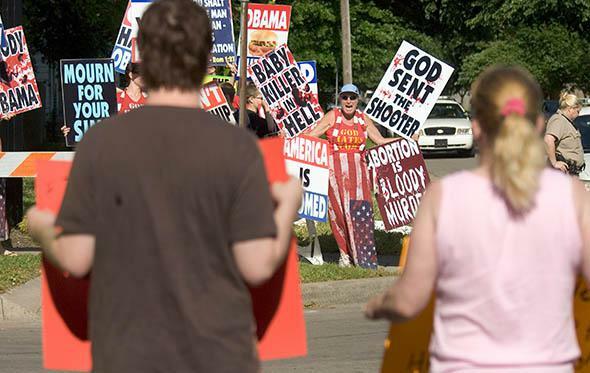 Stationing police officers at home protests of abortion providers. Improving communications between police and abortion providers. Enacting laws restricting or even prohibiting home picketing. Strengthening local laws against stalking. Including abortion providers in hate crime sentence enhancement laws. Protecting providers’ identities in government databases. Understanding the legal concept of “threat” from a provider’s perspective. Labeling this kind of harassment as terrorism. Each of these proposals has various complexities, but they should be part of a strategy to begin to address what for many abortion providers is a regular part of their daily lives—being targeted, threatened, harassed, and terrorized simply because of their profession.